Moonlighter from Digital Sun Games will be arriving on PC via Steam and GOG, Xbox One via Microsoft Store, and PS4 via PSN on May 29, 2018. A Switch version is still coming but will arrive later. 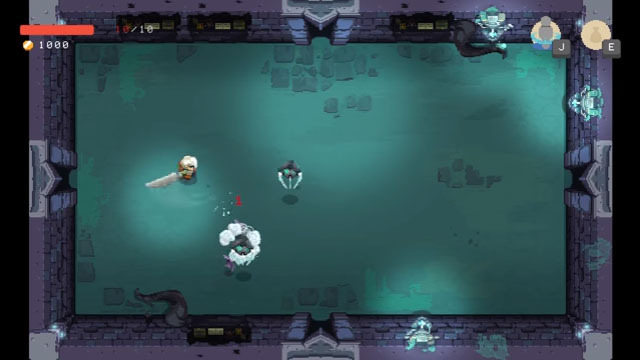 Moonlighter is a roguelike action-RPG starring a shopkeeper named Will who dreams of becoming a hero. By venturing into the nearby dungeons, Will is able to acquire rare items for sale in his shop, which in turn further funds his adventures, allowing him to upgrade his shop, purchase better weapons and equipment, and craft new items. Of course, he also has to manage his shop and make determinations as to whether he should keep or sell valuable artifacts, and how much he should sell items for. He can also fulfill requests for customers who request specific items... and try to prevent customers from stealing his hard-fought goods! The game offers randomly-generated dungeons and loot drops with loads of tough enemies to face, leading to greater rewards for players who make it further in, with dungeon bosses offering rare items when defeated.